Thank you, Peter, I am satisfied. Yes, I'm afraid you are right. The twigs (both visible) have exactly the same configuration, which would not be the case if they were handpainted. The lines on white ground, around the face, also look like printing. But this is not the original cup, this is the other one, obviously. You will have to look at them individually. Such cups/bowls are fairly frequent and they may not be from the same time/batch, originally. It's a bit confusing, though. You should check the other lines, like the outlines of the clothes, etc. - see if they also do show white intermittent breaks in the lines? If yes, then with this cup it is likely that the lines were transfer printed. But, I still have the feeling that the filling may be handpainted. As far as I know there is know way to make areas different color tones with transfer printing (only with the much later raster printing would that be possible). And, with this cup again. 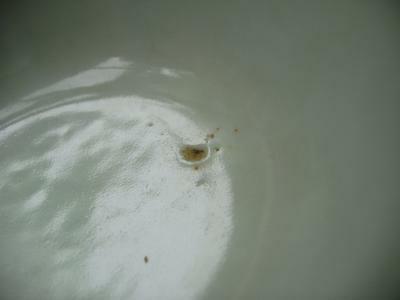 The cup body itself seems to be late Qing dynasty. With this one it is even clearer than with the other one. The foot rim itself looks old too, but what is even more convincing is the interior. You will note the uneven, wavy surface inside. That is a typical sign of the late Qing dynasty. So, body old, lines printed, blue areas possibly painted...I do not know what to make out of it. With the other one the lines don't look transfer printed, to the contrary, some twigs look like brush strokes. You definitely seem to have two different items, painted in different styles. We know that transfer printing did never take really off in China, The bit that was done is mostly from the second half of the 20th century. But we know that transfer printing of simple patterns was occasionally used, together with hand painting earlier, in the Qing dynasty. To summarize the issue, I don't really know when this is from, after seeing the details. 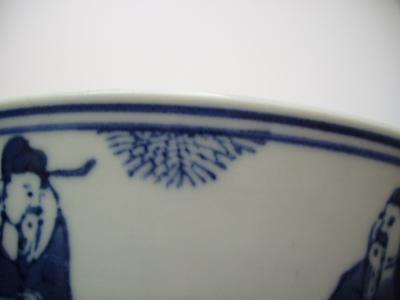 But the cup/bowl bodies seem to be congruent to late Qing dynasty. I would need to inspect it with a magnifier and perhaps do a scratch test to get more information out of it. And, the two are different, both the decoration as well as the body itself. That is all I can tell you from the pictures, I'm afraid.